Where are you in your life timeline? 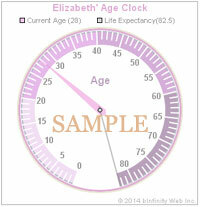 Instantly see on your age clock, plus get life expectancy fyis based on where you live (or, optionally, what-if-ulate). Generate age clock for anyone! *Notes: If you opt to calculate based on country's life expectancy, but do not specify gender, the average life expectancy for that country for men and women is used. Countdown Calculator - Calculate how long until your birthday and other special dates.